Two applicable methods to differentiate structural differences of low alloy steel with the same grain size are presented in this paper. First, an alternative approach is introduced which compared the relative magnitude of ultrasonic attenuation coefficient obtained at the cylindrical surface in round bars upon various heat treatments. Based on the analysis of principle and installation, it is inferred that precluding some ultrasonic losses independent on the microstructure is reasonable while maintaining uniform conditions. The results have shown that comparing the relative value of ultrasonic attenuation coefficient can differentiate the transformation products of various heat treatments of low alloy steel. Then, ultrasonic pulse spectral analysis was performed on the same samples. After eliminating the characteristics of the sound-producing source by the spectral normalization, it is found that, the amplitude, location and amount of the peaks of the power spectral, which characterized different energy distributions in frequency domain, are distinct for various microstructures. Researches have shown that the different approaches both have revealed the possibility of nondestructive ascertaining structural differences for low alloy steel. Noticeably, simply by comparing two ultrasonic spectral, some results that may not be immediately evident from metallography perhaps could be displayed instantly, which can be applied in industry without any great difficulty. Keywords : ultrasonic; relative attenuation coefficient; cylindrical surface; power spectral analysis; transformation products. Ultrasonic microstructure characterization in polycrystalline materials has significant practical implications in determining the quality and structural integrity of materials. The most reliable microstructure estimation is obtained by micrographic examination of samples, which is both destructive and time consuming since it involves polishing, etching and microscopically examining samples taken from the material. Therefore, ultrasonic microstructure characterization technique has become a topic of interest in recent years and different techniques have been used with some success. Based on the various compensations and corrections for a series of losses and errors, a number of early studies examined the correlation between the absolute ultrasonic attenuation coefficient and microstructures [1-4]. Although the absolute attenuation measurement techniques provide an investigated microstructure evaluation, they are limited by the strict measurement condition. Another approach is the attenuation measurement performed with spectrum analysis. It has experimentally proved to be able to nondestructively ascertain forged Cr-Ni-Mo steel and carbon steel by continuous casting . In this paper, two ultrasonic methods used to ascertain structural differences in transformation products of various heat treatments of low alloy steel are presented. One of them utilized the comparison of the relative attenuation coefficient; the other took advantage of the power spectral analysis. Since the relevant theories have been ever presented [6-7], this paper emphasizes on the methods and results for the two techniques. According to the research purpose, either the absolute or the relative attenuation coefficient can be measured. Here, since the attenuation is to be determined in order to assess the differences of microstructures, the relative value is more important than the absolute one. Research  has shown that, for columns contained no flaw, the ultrasonic attenuation coefficient at the cylindrical surface can be measured using the bottom echoes. Figure1 (a) illustrates how the wave diffuses at the cylindrical direction in a columned sample. According to K. Kimura , since the transducer comes into approximately lineally contact with the test cube, the directional property in the cross-section of samples becomes so blunt that it is equal to what a slender transducer does. (b)The diffusion in the plate of which the thickness equals to the diameter of the cylinders. B1 and B2 are the first and second bottom echo respectively; D is the diameter of cylinder sample; L and R are the diffusion and reflection loss respectively. With the principle of the relative value comparison, the uniform conditions during the measurement are very important. Therefore, a series of steps has been taken to ensure that. First, the transducer subjects to a fixed load of 2kg from a steel sheath so as to avoid instability or any manmade interference. Second, locate the sample on a V-shape groove so that the center of the transducer and the sample is overlapping, as shown in figure 2. Here, the coupling media is the lubricating oil. Transducers consisted of 2.5, 5 and 10MHz are used. Moreover, for the every sample, the measurement was repeated for 20 times. Fig 2: Illustration of the locations of samples and the transducer . The specimens were taken from a cylinder of forged steel whose chemical composition was: 0.39%C, 0.36%Si, 0.65%Mn, 0.03%P, 0.03%S, 1.05%Cr. In order to obtain glabrous face and accurate size, all the specimens were grinded elaborately. The nine specimens, measuring f 50 × 65 mm, were divided into three groups numbered 1 to 3. The heat-treatment cycles to which the specimens were subjected are listed in Table 1. 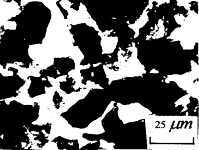 Here, all specimens were austenitized under same conditions of time and temperature to produce identical austenite grain sizes and grain-size distributions. 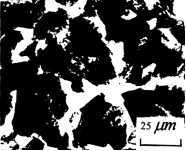 Various microstructures are produced according to the different steps subsequently. After the measurements had been made pieces were cut from the specimens and micrographs were made (figure 3-5). These clearly illustrate the different structures produced by the various heat treatments. The average grain size d of specimens was about 0.029mm. Fig 3: Micrographs of normalized specimen (left-outside;right-center). Fig 4: Micrographs of quenched specimen (left-outside;right-center). Fig 5: Micrographs of quenched plus tempered specimen (left-outside;right-center). Figure 6 demonstrated arela of the samples upon various heat treatments, where arela is the relative ultrasonic attenuation coefficient. It was found that, at the every frequency, arela of these heat treatment cycles are significantly different, despite every group values during the repeated measurement fluctuating in a range. Clearly, arela significantly different, despite every group values during the repeated measurement fluctuating in a range. Clearly, in normalized microstructure was the biggest and the value in quenched plus tempered microstructure was the smallest. Furthermore,arela increases with the advance of the frequency, as figure 7 shown, which illustrated the relation of via the frequency, where is the average value of arela . These results were similar to the research on SAE4150 steel by E. P. Papadakis . With this method, arela contained L, R and coupling loss, etc, these ultrasonic losses independent on the microstructure can be precluded while maintaining uniform conditions. Fig 6: in transformation products upon different heat treatment steps . Ultrasonic spectroscopy is the study of ultrasonic waves resolved into their Fourier frequency components. Since many material properties manifest themselves as amplitude or phase changes in ultrasonic waves used to interrogate a specimen, ultrasonic spectroscopy has proved to be valuable [10-15]. The authors presented a new ultrasonic spectroscopy method based on theoretical predictions. Using the method, it is possible to differentiate heat treatment states of low alloy steel with a single transducer. The power spectrum shows the energy distribution in the frequency domain and highlights the main frequency in the signal. Since it contains the statistical ideas, the power spectrum is often used to analyze random time sequence. here, P(f) S(f) and S0(f) and are the Fourier transform of p(t) s(t) and s0(t) respectively. Figure 8 shows a block diagram of the ultrasonic spectral analysis system constructed in this study. Results presented here were obtained by the immersion method by using water as the sound-coupling medium with the pulse-echo reflection mode. The instrumentation consists of a signal generator, transducer, oscilloscope, sampler and spectral analyzer. The narrow-band, focus-type transducer is excited by an industrial ultrasonic instrument and is joined to the specimen under test. The signals from the test specimens (multiple echoes), received at the transducer, are respectively sent to an oscilloscope, where their amplitude is read directly, and to the sampler, which performs the sampling of signals. Signals from the sampler transmit to the spectral analyzer where the spectrum of the signal concerned is photographed. Fig 8: The instrumentation consisted of a number of instruments to generate and analyze ultrasonic signals. The reflected waveform contains the characteristics of the sound-producing source as well as desirable information pertaining to the material being inspected. A Fourier transform of reflected signal from pure water was used as a normalizing function to filter out the characteristics of the source. The waveform from the water and its power spectral are shown in figure 9. Typical normalized spectrums of specimens are shown in figure 10-12. Fig 9: The ultrasonic waveform obtained from distilled water and (b) its power spectral. Fig 10: Two normalized power spectral from different sites for normalized specimen. Fig 11: Two normalized power spectral from different sites for quenched specimen. Fig 12: Two normalized power spectral from different sites for quenched plus tempered specimen. There were great differences and some similarity for the normalized power spectral of the three heat treatment products. From fig10-12, it was found that, the peak emerged at 7.34375MHz was the same composition for all the specimens. In addition, there was another spectral peak appeared at 4.57031MHz for pearlite plus ferrite. For quenched martensite, other more than four peaks respectively arose at 1.48438MHz, 2.57813MHz, 3.78906MHz and 4.57031MHz. Furthermore, it was noticed that, the relative scales of the peak values at above-said frequencies of fig.11 were not same. For tempered martensite, however, there was only one supplemental small peak except 7.34375MHz.These power spectral indicated different energy distributions in frequency domain for various heat treatment transformations products. For the relative attenuation coefficient measurement, the smoothness of cylindrical surface and the consistency of size (especially the diameter) of the samples influence the results. By the way, the bigger the diameter is, the more precise the measurement is, since the dispersiveness of B1 and B2 is inverse proportional to the diameter. Moreover, the axial length of samples must be big enough to avoid the boundary effect. Despite the upper limitations, compared to a series of compensations and correctors during the absolute attenuation coefficient determination, the relative attenuation coefficient is easy to be performed. Compared the relative attenuation coefficient measurement, the power spectral analysis technique has significant practical implications. However, a large quantity of careful and deep research should be fulfilled, including the relation of location, amount and amplitude of the peaks of the spectral and the quantificational microstructure, etc. No matter how, the results have indicated the potential feasibility of the ultrasonic method for ascertaining structural differences in low alloy steel, which has further manifested the wide use and the developmental tendency of ultrasonic evaluation technique. The authors are very grateful to Zhang Qingjun for his invaluable cooperation in producing the specimens, and to Xu Weiping and Wang Xiumin for helping us to make metallography analysis.